The following lost their lives in the Second World War. The following names from those killed in the Second World War (1939-1945) are included on the War Memorial. They are listed in date order of their deaths. We will have further details about these men shortly. The photograph on the left is of Cedar Grange taken in the 1940s and showing how it would have looked when Nigel Beaumont-Thomas lived there. Nigel was awarded the Military Cross for bravery and his biographical details are included on this page. Private Fred Foster of the 7th Battalion of the Royal Norfolk Regiment was just 20 years of age when he lost his life. He was the son of Robert and Emma Foster of Hethersett. He is buried in St Valery En Caux Franco British Cemetery. The German thrust through the Ardennes in 1940 split the British forces, with those in Belgium forced back towards Dunkirk. Other units like the 7th Royal Norfolks had been stationed in support of the Maginot line near the Saar. To avoid being encircled, they staged a fighting retreat eastwards supporting the French forces. Eventually they ended up on the coast at St Valery-en-Caux. This was not to be a second Dunkirk, as initially hoped. There were no wide beaches where shelter could be sought. The Germans took the commanding heights around the town, and soon no vessel could approach, and the allied troops became increasingly concentrated in a built up urban area - an easy target for German Bombers and Artillery. On the 12th June 1940 the town surrendered and units like the 7th Norfolks marched into five years of captivity. In the confusion, not all the soldiers could be accounted for. Raymond Coller was a Major in the Royal Artillery and was killed by enemy action. A Coller family tombstone exists in the churchyard at Hethersett where the inscription reads as follows: "“In proud and loving memory of Raymond Geoffrey Coller, Major Royal Artillery. Killed by Enemy Action, 10th December 1940” It also commemorates his wife Beryl Mary Lempriere Coller (nee Back) who died on 8th April, 1950, aged 49. It is likely that Major Coller was killed during a raid on London. His death is recorded in the Islington District and this could have been in a hospital after being hit in another part of London. Frederick James Boswell was an Aircraftman 1st Class in the Royal Air Force Volunteer Reserve. He was 21 when he was killed on 5th July, 1941. He was the son of William and Muriel Boswell of Norwich and is remembered on the Runnymede Memorial, whihc is about four miles from Windsor and overlooks the River Thames. The Air Forces Memorial at Runnymede commemorates by name over 20,000 airmen who were lost in the Second World War during operations from bases in the United Kingdom and North and Western Europe, and who have no known graves. They served in Bomber, Fighter, Coastal, Transport, Flying Training and Maintenance Commands, and came from all parts of the Commonwealth. Some were from countries in continental Europe which had been overrun but whose airmen continued to fight in the ranks of the Royal Air Force. The memorial was designed by Sir Edward Maufe with sculpture by Vernon Hill. The engraved glass and painted ceilings were designed by John Hutton and the poem engraved on the gallery window was written by Paul H Scott. The Memorial was unveiled by The Queen on 17th October 1953. Frederick Boswell was lost with the sinking of SS Anselm. The SS Anselm was built in Dumbarton in 1935, a coal fired passenger ship, she was converted to a troop ship in 1940. The SS Anselm was sunk by U96 5 July 1941 about 300 miles north of the Azores while on passage from Gourock to Freetown carrying 1,200 troops. 250 troops and 4 crewmen were lost. The Monthly Anti-submarine Report for September, 1941, states that immediately preceding the attack, HMS Challenger and SS Anselm were in line ahead and were being screened by HMS Lavender and HMS Petunia. HMS Starwort, whose Asdic (anti-submarine detection equipment) was out of order, was stationed astern. The escorts had been keeping listening watch in thick fog, but at 0350 the fog cleared and both ships commenced transmitting. At this time, HMS Lavender and HMS Petunia took up screening positions on either bow of HMS Challenger and commenced a zigzag on a course just east of south at a speed of 11 knots. At 0426, in approximate position 44 30N, 28 30W, not far from the Canary Islands, the SS Anselm was struck by a torpedo on the port side amidships. The SS Anselm settled rapidly by the head and sank 22 minutes after being hit. All the lifeboats got away with the exception of No 6, which was damaged by the explosion. By skilful manoeuvring, HMS Challenger placed her bow alongside the SS Anselm’s port quarter, and in this manner rescued 60 men. Unfortunately 254 men, including 175 RAF personnel, lost their lives, but it is probable that many of these were killed by the explosion of the torpedo which struck the ship immediately below the accommodation space. John McAnally was a pilot in the Royal Air Force and was aged 23 when he was killed on July 7th, 1941. He was the son of the Rev James McAnally and Francisca McAnally of Wiltshire. He is buried in the As Communal Cemetery in Belgium. It seems likely that John McAnally was flying in a Wellington Bomber during an operation on Cologne on 7th and 8th July. The plane crashed at Genk-Bodem in Belgium. There was only one survivor who was taken prisoner of war. First Officer Alan Rees Colman of the Air Transport Auxiliary was 42 when he died. He was the son of Russell and Edith Colman and husband of the Honorable Victoria Colman. He is remembered on the Lawnswood Crematorium in Leeds, Yorkshire. He was delivering a Hawker Hurricane when he crashed on landing at Sherburn and tipped into the water and was drowned. Ernest Frederick Yull was a sailor on the SS Empire Mahseer and was 22 years of age when he died on March 4th, 1943. He was married to Elsie Yull. He is remembered on the Tower Hill Memorial in London. The Tower Hill Memorial commemorates men and women of the Merchant Navy and Fishing Fleets who died in both World Wars and who have no known grave. It stands on the south side of the garden of Trinity Square, London, close to The Tower of London. SS Empire Mahseer was torpedoed on March 4th with 18 fatalities and 36 survivors. The master, 29 crew members and six gunners were picked up by HMS Norwich City and landed at Durban. The ship's route was Fanara - Durban - Bahia - Trinidad - Baltimore. Able Seaman Louis Leslie Bunn served on HMS Charybdis and was just 19 years of age when killed on October 23rd, 1943. He was the son of Walter and Maria Bunn of Hethersett and is buried in St Peter Port Cemetery in Guernsey. HMS Charybdis was hit on the port side by two torpedoes and sank within 30 minutes. A total of 426 lost their lives and 107 were rescued. Nineteen British sailors, including Louis Bunn were buried with full military honours in Foulon Cemetery, Guernsey, on Wednesday 17th November, 1943. At least 4,000 dignitaries and Islanders were present to honour the men. Since 1948 an annual remembrance service for the loss of the ship is held in Guernsey. Henry Robert Jeckells was a private in the Royal Norfolk Regiment and aged 28 when he died on March 3rd, 1944. He is buried in Chungkai War Cemetery, Thailand. Henry Jeckells is one of the hundreds of men who marched into captivity with the fall of Singapore in February 1942. He subsequently died as a prisoner of the Japanese. Nigel Beaumont-Thomas was born in London on 17th April, 1916, and educated in Hampstead, at Harrow and Trinity College, Cambridge. In 1939 he joined the firm of Richard Thomas and Co Ltd as a civil engineer. On 10th June, 1939 he was commissioned into the Royal Engineers and mobilised on 24th August, 1939. From 1939 to June 1941 he was attached to the King's Own Bengal Sappers and Miners serving in India, North Africa, Abyssinia (where he was wounded) and North Africa. For a time he was a prisoner of war in Italk but escaped in September 1943 and made his way back to the United Kingdom in 1944. From May 28th until his death he was second in command of the 4th Parachute Squadron and was killed in action at Arnhem. He had already been promoted to the rank of Major. 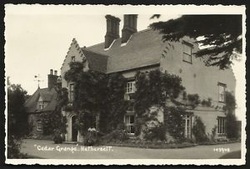 Nigel Beaumont- Thomas lived at Ceder Grange in Hethersett. In his will he left over £116,000. On the outbreak of war in 1939 he was immediately called up, and drafted in November 1939 to India, as an officer in King George V's Bengal Sappers and Miners. There he learnt Hindustani, 'essential in dealing with Indian troops'. A year later he was in North Africa, with a diversion to the Italian Campaign in Abyssynia and Ethiopia where he was wounded, and spent some time in hospital. Then it was back to the North African desert, and the long tussle along the Mediterranean coast. It was during that weary and often frustrating campaign that he was awarded the Military Cross. The citation recorded that he was commanding two par­ties of engineers who were being held in readiness to clear obstacles in the path of a tank advance through the Halfaya Pass (known to all British soldiers as 'Hellfire'). Some of the tanks penetrated a minefield and, coming under heavy bombardment, stopped. Nigel was ordered forward to rec­onnoitre. He reached the tanks which were under heavy fire from machine guns and anti-tank guns at close range. He made his way under heavy fire to the subaltern commanding the tanks, found out the situation from him and then coolly and deliberately and still under fire examined the minefield, bringing back valuable information as to its layout. Later he returned to the tanks with the Brigade Commander's orders. Any movement at once attracted heavy fire. He made his way again to the tank commander's tank and spoke to him. The latter was killed while Lieut. Thomas was still there. He then went on according to orders and gave instructions to the carriers of the infantry battalion which had been supporting the tanks. During the 16th and 17th of June  Lieut. Thomas remained in the area removing mines and marking the minefield still under fire. This officer's work was of the greatest value. His cool courage and determination to carry out his task at whatever cost was exemplary. Just one year later, on 20 June 1942, promoted to Major, Nigel was captured at the fall of Tobruk. In the first con­fusion he managed to escape by coolly marching past the German guard with a friend, coat collars turned up in Ger­man fashion and prattling away in his fluent and colloquial German, while other prisoners created a diversion in the camp. The two of them lived in a cave for some days but were then discovered and recaptured. When it became clear that they were to be flown to a prisoner-of-war camp in Italy, Nigel devised a plan to take over the aircraft in mid-flight: he, a qualified and experienced pilot, would then fly it back to the Allied lines in North Africa. Several fellow-prisoners agreed to participate, but the scheme misfired when they were put on to different planes, and the new passengers refused to go along with the plan. So Nigel found himself incarcerated in Italian prisoner-of-war camps, first in the south and later, for most of 1943, in the north. Major Philip Tower, who with Andy Howard was the closest to him in the Italian prisoner-of-war camp, remembers him as 'far the most impressive person I've ever met'. With the Allied invasion Nigel and a fellow officer saw the chance to escape. Nigel Thomas and Philip Tower walked out of the camp (by trampling down the wire at the perimeter fence) and made for the mountains. It was a hard journey of some 600 miles. They kept as far as possible to the high mountain ranges. As they approached the war zone north of Naples the November nights became bitterly cold. They took to sleeping by day and walking at night. Eventually on 15 November they passed through the German lines and arrived at an Allied unit. Unfortunately on the last leg of the journey Philip Tower was wounded, and on their arrival he was immediately flown for treatment to hospital in Algeria. The First Airborne Divison went in on 17 September (1944), and Nigel Thomas with them as a 'parachuting engineer'. All too soon the troops at Arnhem found them­selves encircled by a numerous and heavily equipped enemy. On September 18th the squadron took off from Spanhoe Airfield After taking off the aircraft circled the airfield once to formate and then set off . The flight was largely uneventful. The men in 1 Troop in a C-47 with Captain Beaumont-Thomas recalled that he gave a running commentary in a calm and reassuring manner as he stood in the door looking at the ground below, more notably when an adjacent aircraft was shot down, he stood in an open doorway shouting “steady there chaps, stand ready“. He is remembered with great pride for his coolness, efficiency and confidence as if it were a regular occurrence for him. Parachute elements were dropped 1420 hrs on drop zone Y West of Arnhem. On landing the Commanding Officer Major Aeneas Perkins received arm injuries, Captain Beaumont-Thomas was ordered to take command. September 19th. The majority of the squadrons containers were lost during the drop, Capt. Thomas ordered the men to try to find them, much was lost to opposing forces. 1900 hrs, Capt J.G Smith 1 Troop joined ½ 3 Troop, all under command of Capt N. Beaumont-Thomas in support of 21 Indian Parachute Company. Captain Beaumont-Thomas seemed to be the only one who knew what was happening and soon got everything organised. Nigel was hit during a mortar attack at about 1000 hrs on September 20th 1944 and badly wounded, he was taken to Ommershof House for treatment, Sapper Leonard administered medical treatment but Nigel died from his injuries. Nigel's father Lionel was also a fascinating character and deserves his own chapter. You can read about him extensively by clicking here. Lionel Beaumont-Thomas also held the Military Cross and was initially a wealthy Welsh businessman. He became Conservative MP for Birmingham King's Norton from 1929 to 1935. During the first world war he served in the trenches and at the Battle of the Somme. Percy Frederick Huggins was a craftsman with the Royal Electrical and mechanical Engineers and was 31 when he died on January 4th, 1945. He was the son of Frederick and Margaret Huggins of Hethersett and is buried in the El Kebir War Memorial Cemetery, Egypt. Jack Weston was a trooper in the Reconnaissance Corps and was 22 when he died on 18th March, 1945. He was the son of Mr and Mrs W. E. Weston of Hethersett and is buried in the Reichswald Forest War Cemetary, Germany. The regiment were in action around Xanten at this time, fighting against the final resistance of the Germans on the west bank of the Rhine prior to the Rhine crossing on 28th March.